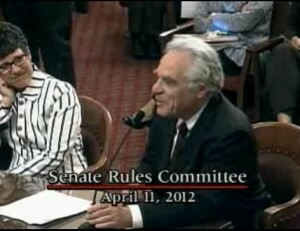 Boeing lobbyist Peter Weiner testifies in support of DTSC director Debbie Raphael at her April 11 confirmation hearing. Boeing pays a pretty penny to get what it wants – its lobbying expenses rank among the top five corporations in the country. The non-profit Public Campaign produced a report in December 2011 which concluded that Boeing spent $52.29 million on lobbying yet did not pay taxes during 2008-2010. Though it made a profit of $9.7 billion, Boeing received $178 million in tax rebates. According to the report, in 2010, Boeing increased executive pay by 31% to $41.9 million for it’s top 5 executives, while laying off 14,862 workers since 2008. Rocketdyne cleanpup activist Marge Brown doesn’t need a report to know the score. 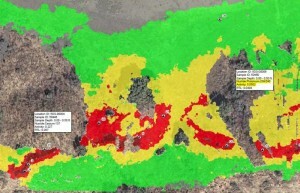 “If you are a large and wealthy corporation that does not want to pay for a costly cleanup to background of radionuclides in your soil, all you really need to do is to use a sophisticated plan to get all of the sincere and eager environmental activists to fight among themselves,” Brown said in an EnviroReporter.com interview in November. Brown was referring to attempts to astroturf the Rocketydne community, aided by Boeing’s slick new greenwashing campaign. Rocketdyne activists aren’t the only ones who object to DTSC’s polluter-friendly practices. The consumer advocate organization Consumer Watchdog recently issued a stern criticism of DTSC for its permissiveness with environmental violaters including Chevron and Evergreen Oil. The Santa Monica-based group said that DTSC staff folded “like a wet paper bag” before industry. Of course, other voices weighed in at Raphael’s confirmation hearing too, including Boeing lobbyist Peter Weiner who was a former Special Assistant to Governor Jerry Brown for Toxic Substances Control and is a current member of the DTSC Director’s External Advisory Group. Other former DTSC and EPA staff lobby for Boeing as well, an issue recently addressed by a group of concerned environmental leaders in Los Angeles with Raphael. When questioned about DTSC’s “revolving door” that allows former staff who become lobbyists to influence the department, Raphael responded that, essentially, former DTSC staff can lobby for polluters but are not allowed to be effective. It is unlikely that Boeing is paying its lobbyists like Weiner for nothing. Raphael’s beaming smile next to Weiner at her confirmation hearing did little in the way of convincing activists that she was uninfluenced by the man who had formally held her position. Community activists say that is patently absurd, and contend that not only do Boeing and its allies unduly influence DTSC decisions, they are the only ones DTSC hears – that DTSC has turned its back on the community and on thousands of people who support the Agreements on Consent (AOCs) between DTSC and the Department of Energy (DOE) and the National Aeronautics and Space Administration (NASA) to clean up their polluted sites at Rocketdyne, as the Santa Susana Field Laboratory (SSFL) is commonly called. The activists contend that DTSC also dismissed the concerns of the hundreds of people who support the Work Group over a CAG by a ratio of 4 to 1. Boeing lobbyists, they say, have helped DTSC systematically undermine the very cleanup it’s supposed to supervise. Five years ago, the struggle to cleanup SSFL began to look up. First, in August 2007, DTSC entered into a Consent Order for Corrective Action with all three responsible parties – Boeing, DOE and the NASA. 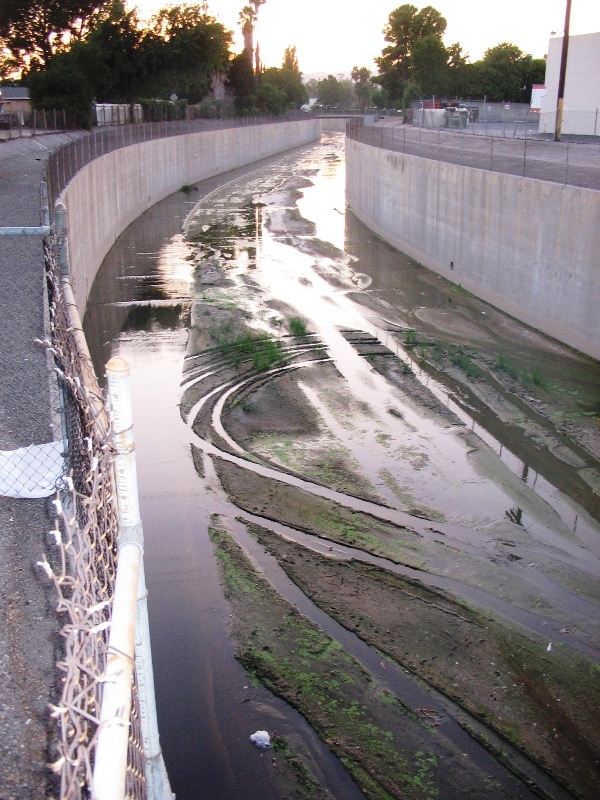 Cleanup activists were optimistic, but felt that more was required to give DTSC the authority required to ensure the site was cleaned up properly. In October 2007, state law SB 990 was passed, ensuring that the site would be cleaned to the strictest standards. In January, 2008, activists scored another victory in making sure that the state stayed in control of the cleanup. DTSC subsequently began a process to amend the Consent Order to include provisions of SB 990. In September, 2009, the agency was having trouble getting Boeing on board with a revised consent order as Boeing alleged it wasn’t afforded “the same rights” as the other responsible parties. On November 2, 2009, a revised draft consent order that included Boeing, NASA, and DOE was announced. But it was not to be. Boeing protested that the SB 990 cleanup standards were too high, would cause it undue financial burden, and in a unique twist of logic, would jeopardize SSFL’s habitat and harm the community. On November 13, 2009, Boeing sued the state. DTSC nevertheless began to work on new cleanup agreements with NASA and DOE to cleanup the lab to background levels of chemical and radiological contamination. Though Boeing was not part of the agreements, it continued to spread misinformation about such a cleanup, including the wild claim that 1.6 million cubic yards of soil would have to be removed from the site, a reversal of its years-long contention that SSFL was not contaminated. This and other inaccurate rumors about the agreements – that they wouldn’t allow in-situ treatment, would harm wildlife and would require stricter cleanup levels than SB 990 – were vigorously debunked by the state and cleanup advocates. Ultimately, after two extensive public comment periods, a total of 3,700 comments were received with the vast majority in support of the agreements and only a handful opposed. On December 6, 2010, the historic Agreements on Consent were signed with NASA and DOE. Longtime community members were thrilled, and elected offcials encouraged Boeing to join in. In March 2011, State Senator Fran Pavley introduced a provision in a California budget trailer bill that would codify the AOCs. Even though the agreement didn’t involve Boeing or it’s portion of the property, it lobbied against the trailer bill and misinformation spread that the bill would take away the California Environmental Quality Act (CEQA) powers in the agreements. The bill did just the opposite – it would have codified the full agreements, including their CEQA provisions. But Boeing and its supporters wanted the AOCs to be more easily overturned, and they successfully killed the bill. A month later, Boeing emerged victorious in overturning SB 990. At an April 11, 2011 hearing, community members were aghast and perplexed with the state’s poor performance in defending the law, claiming that large inaccuracies in Boeing’s statements were left unchecked by DTSC. 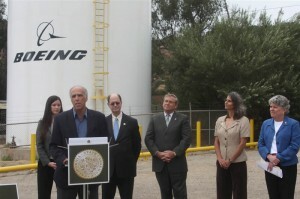 A few days later, April 27, the court sided in favor of Boeing, with Judge John F. Walter ruling that the law singled out the Santa Susana Field Laboratory for “uniquely onerous treatment.” The state is appealing the decision, and community organizations have filed an amicus brief in support of the state hoping, perhaps naively, that the state stand up to the multinational giant.